Singles? We Don’t Need No Stinkin’ Singles. Hell and Black are universally beloved; most rock fans will raise a toast to Salute too. The self-produced Flick of the Switch, however, is another story. It charted well, went platinum too (eventually), but the magic was missing. Maybe it was the absence of producer Mutt Lange, who knew how to wring every drop of energy from the band’s formula, or the passage of time. There are no shortage of AC/DC fans who will champion this album; Powerage too, if you give them a chance. And I would agree with them that Flick of the Switch is a very good, maybe even great, album. I miss the ice-cold intros of their last few albums, but the reality is that after five or ten seconds it’s all the same: the band settles into a mighty groove, Angus delivers an amazing solo and Brian Johnson belches fire and belts out innuendo. In fact, as some have pointed out, Brian’s performance is one of Flick’s best features. What the album lacks is a standout single to rally around. “Nervous Shakedown” could have been that single, but the labels (or someone) chose “Guns For Hire” instead, which isn’t the first, second or third-best song on here. AC/DC, however, didn’t need no stinkin’ singles to succeed; if you don’t like this album, you weren’t an AC/DC fan to begin with. This is AC/DC with the sugar scrubbed off. Personally, I admire the band for tossing off the trappings of success and returning to their roots. “Rising Power,” “Deep In The Hole,” “Nervous Shakedown” and “Flick of the Switch” belong with their better songs over a long career. They’re not rock & roll anthems, and I don’t think the band had anthems on their mind when they made this album. What I hear on Flick of the Switch is a band reclaiming their legacy and making the sort of single-minded record that got them this far in the first place. All songs written by Angus Young, Malcolm Young and Brian Johnson. Brian Johnson (vocals) Phil Rudd (drums), Cliff Williams (bass guitar), Angus Young (lead guitar), Malcolm Young (rhythm guitar). Produced by AC/DC; engineered and mixed by Tony Platt. 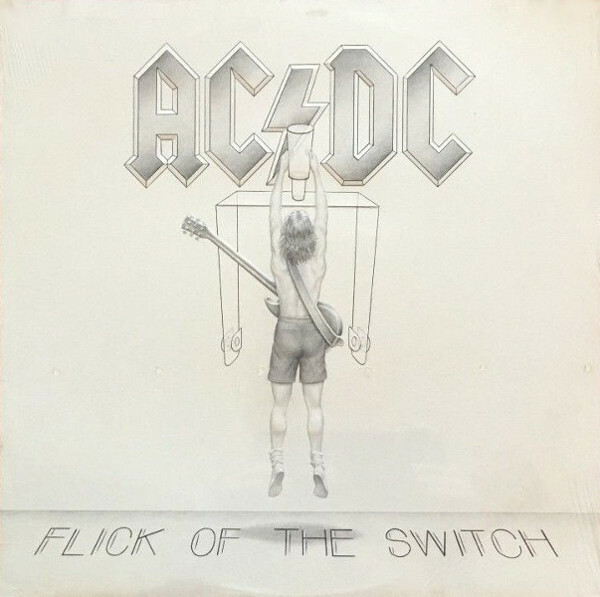 Cover design by AC/DC, drawn by Brent Richardson. Released on elpee and cassette on August 15, 1983 in Australia (Albert, APLP/TC-APLP-061), the US (Atlantic, 80100-1/4), the UK and Germany (Atlantic, 78-0100-1), Argentina, (Atlantic, 80407), Canada (Atlantic, A1-80100/78 01004), Japan (Atlantic, P-11339), Mexico (Atlantic, LWDA-6203) and Yugoslavia (Suzy, 478-0100-1); reached #15 on the US charts (RIAA-certified platinum record) and #4 on the UK charts. Re-issued on compact disc in Canada (Atlantic, 92448). Re-issued on compact disc in the US (Atlantic, 80100-2). Re-issued on compact disc on August 10, 1989 in Japan (Atlantic, 18P2-2762). Re-issued on compact disc in 1993 in Australia (Albert, 465259-2). Re-released on remastered compact disc in Japan (Atlantic, AMCY-6227). Re-released on remastered 180g vinyl elpee and compact disc in 2003 in the US (Epic, E-/80209) and the UK (Epic, 510767-1/2). Re-issued on remastered compact disc in 2007 in Japan (Epic, EICP-909). Re-issued on remastered compact disc in 2008 in Japan (Sony, SICP-1709).